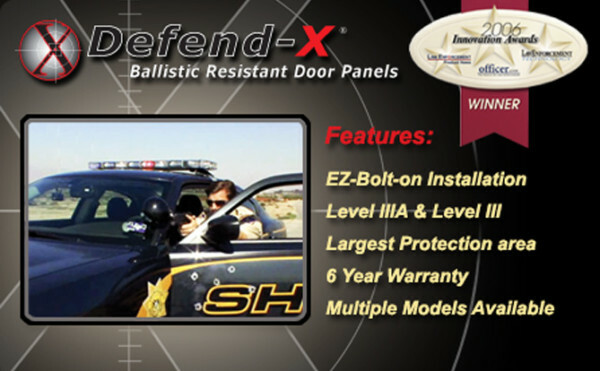 Defend-X® vehicle door panels provide a ballistic resistant and blast mitigating shield behind which law enforcement officers can take cover during a life-threatening encounter. Our Innovative Patent-Pending surface mount bolt-on system installs on the inside of the door in minutes with minimal tools. Defend-X® Door Panels provide the largest ballistic protection area in the industry and can be installed on new vehicles or retrofitted to your existing fleet. Defend-X® Door panels can be removed and re-installed at the end of the vehicle service life. Our Level III door panels defeat rifle threats of 7.62 X 51mm FMJ NATO BALL and will stop AK47, 7.62 X 39mm, AK74, 5.45 X 39mm with mild steel core and all lower assault/hunting rifle cartridges, including ALL handgun projectiles.